Chart No. 2 - Evolutionary Radiating Vital Energy Which Sustains All Body Functions. Anterior Waves from the Center Out and Contacts from the Umbilicus. 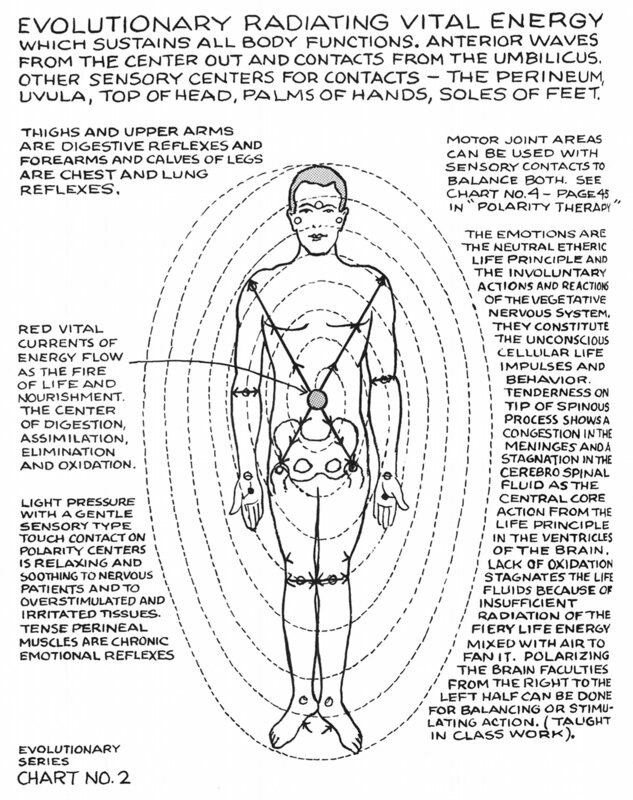 Other Sensory Centers for Contacts - the Perineum, Uvula, Top of Head, Palms of Hands, Soles of Feet. Thighs and upper arms are digestive reflexes and forearms and calves of legs are chest and lung reflexes. (A) Red vital currents of energy flow as the fire of life and nourishment. The center of digestion, assimilation, elimination and oxidation. 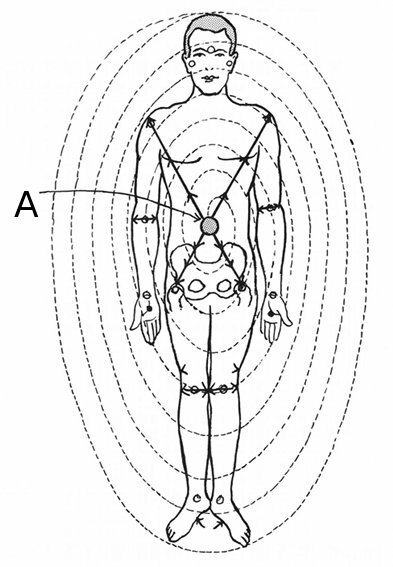 Motor joint areas can be used with sensory contacts to balance both. See Chart No. 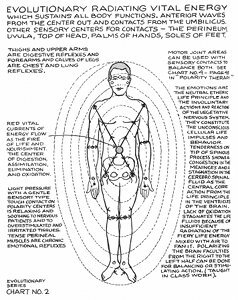 4 - page 45 in "Polarity Therapy"
The emotions are the neutral etheric life principle and the involutionary actions and reactions of the vegetative nervous system. They constitute the unconscious cellular life impulses and behavior. Tenderness on tip of spinous process shows a congestion in the meninges and a stagnation in the cerebro spinal [cerebrospinal] fluid as the central core action from the life principle in the ventricles of the brain. Lack of oxidation stagnates the life fluids because of insufficient radiation of the fiery life energy mixed with air to fan it. Polarizing the brain faculties from the right to the left half can be done for balancing or stimulating action. (Taught in class work).